A study by University of Adelaide researchers and Queensland Government scientists has revealed what south-east Queensland's rainfall was like over the last 7000 years Ð including several severe droughts worse and longer lasting than the 12-year Millennium Drought. The study - published in Scientific Reports - used preserved paper-bark tea tree leaves from North Stradbroke Island's Swallow Lagoon that have been collecting in the sediment for the past 7700 years. The leaves Ð analyzed for chemical variation-provided a wealth of information on the El Nino-Southern Oscillation (ENSO) and how it was impacted by major climate changes over the millennia, including the Little Ice Age from about 1450 to 1850. Researchers found a generally wet period about 5000 to 6000 years ago - indicating a more consistent La Ni–a-like climate. This newly-discovered relationship could help scientists better predict the path of oncoming hurricanes, especially in late summer months like September, when Atlantic hurricane activity peaks. In terms of lives lost and property damaged, floods are just behind tornadoes as the top natural disaster. In the United States, flood damages totaled $8.41 billion in 2011. There were 113 flood-related deaths. Floods can affect any area to some degree; wherever rain falls, flooding can occur. As water falls to the Earth in the form of rain or snow, it seeps into the ground. But if the ground is frozen or the surface impervious (asphalt or concrete are two contenders) or the soil is already saturated and cannot absorb the water faster than it falls from the sky, problems arise. The Global Precipitation Measurement mission or GPM constellation of satellites provide data on precipitation rates and totals. Recently the GPM core observatory measured the heavy rainfall that caused extensive flooding and loss of life in Peru. Extreme flooding and frequent landslides that occurred in March have forced many from their homes. An El Nino-like condition with warm ocean waters developed near Peru's coast. This extremely warm water off Peru's western coast has been blamed for promoting the development of these storms. Equatorial sea surface temperatures (SSTs) are about average elsewhere in the central and east central Pacific. Temperatures in the Arctic are predicted to soar nearly 50 degrees above normal on Thursday in a pre-Christmas heat wave that will bring the frozen tundra scarily close to the melting point. It's the second year in a row the North Pole - now in perpetual darkness after saying goodbye to the sun in late October - has seen abnormally high temperatures around the Christmas holiday. It's also the second time this year. In November, temperatures in the region skyrocketed 36 degrees above normal. Bob Geldof and Midge Ure are better musicians than they are meteorologists. Their 1984 Band Aid prediction that "there won't be snow in Africa this Christmastime" has once again been proven wrong -- and this time in spectacular fashion. The Algerian town of Ain Sefra, deep in the dry, hot Sahara desert was hit by a freak snowfall on December 19. It's the first time snow has fallen in the region in 37 years. The beautiful 'fog bow' stunned onlookers with its magical aura shining against the bright blue sky. 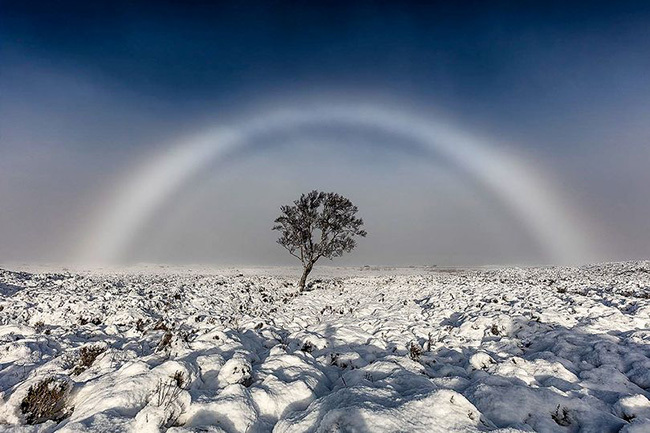 The rare white rainbow was captured on Rannoch Moor in Scotland. The image from Rannoch Moor in the west of Scotland was captured by Melvin Nicholson. Out walking on the moor, south of Glen Coe, he said the unbelievably beautiful white rainbow appeared before him. It is a colorless rainbow that is made up of tiny water droplets that cause fog. The National Oceanic and Atmospheric Administration (NOAA) released its global temperature data for September. It shows that the month was a scant 0.07°F (0.04¡C) below September 2015's record, making it the second-warmest September on record. That ends a streak of 16 consecutive record-setting hot months in NOAA's dataset, a record-setting streak itself. The run of planetary heat has rewritten the record books. On Tuesday, the National Oceanic and Atmospheric Administration (NOAA) released its global temperature data for September. Extreme weather events are nothing new, but they appear to be gaining strength. Scientists have risked life and limb to help us better understand - and better survive - these storms. The deadliest and most expensive natural disasters in U.S. history, however, were both hurricanes: the great Galveston hurricane of 1900, which killed some 6,000 to 12,000 people, and the notorious Hurricane Katrina in 2005, which caused an estimated $149 billion in damages. The formation of a distinct pattern of sea surface temperatures in the middle of the North Pacific Ocean can predict an increased chance of summertime heat waves in the eastern half of the United States up to 50 days in advance. The pattern is a contrast of warmer-than-average water butting up against cooler-than-average seas. When it appears, the odds that extreme heat will strike during a particular week--or even on a particular day--can more than triple, depending on how well-formed the pattern is. At first glance, it stands out like a sore thumb. That blob of blue and purple on the map. One of the only places on the globe that is abnormally cold in a year that will likely shatter records as the warmest globally. It's being called the Atlantic "blob." It's a large area in the North Atlantic that is seeing a pronounced cooling trend. The ocean surface is much cooler than normal and in fact record cold in some locations. Scientists began to notice it developing over the last couple of years, this cooling in the Atlantic is the complete opposite of the warming over in the Pacific. Much of the warming is attributed to El Nino, a natural process where warm water sloshes over the Central Pacific and extends to South America, but scientists are unable to completely explain what has been dubbed the Pacific Blob. This pronounced warming over large areas of the entire Pacific basin has fueled a well above average season for hurricanes and typhoons over the entire Pacific, and could have contributed to everything from the California drought, impacts on the salmon industry, and even tropical sharks seen in waters further north than ever before. The planet is on course to experience one of its warmest years on record, but scientists have been left baffled by a massive cold patch in the North Atlantic Ocean. The area, which lies just to the south of Greenland and Iceland, is showing some of the coldest temperatures ever recorded for the region. It comes at a time large parts of the world are experiencing some of the hottest on record, raising fears the recent 'pause' in global warming has come to an end. An ancient cave with centuries of Chinese characters written on the walls reveals the history of severe droughts. By tying the cave graffiti to ratios of chemical elements in the stalagmites growing in the cave, a team of scientists created a snapshot of the climate over the last 500 years, said study co-author Sebastian Breitenbach, a paleoclimatologist at the University of Cambridge in England. The findings also suggest how vulnerable people in this region could be to drought. A series of astounding images of a 'dirty thunderstorm', captured by volcano film-maker Marc Szeglat earlier this month, show the earth's power at its most terrifying and breath-taking. Dirty thunderstorms are a rare phenomenon, associated with large volcanic eruptions. But unusually and perhaps uniquely, they occur regularly at Sakurajima volcano in Japan, one of the most active volcanoes in the world. Enjoy the pause in global warming while it lasts, because it's probably the last one we will get this century. Once temperatures start rising again, it looks like they will keep going up without a break for the rest of the century, unless we cut our greenhouse gas emissions. The slowdown in global warming since 1997 seems to be driven by unusually powerful winds over the Pacific Ocean, which are burying heat in the water. But even if that happens again, or a volcanic eruption spews cooling particles into the air, we are unlikely to see a similar hiatus, according to two independent studies. Climate change is driving the Greenland Ice Sheet to melt, which is contributing to sea level rise. But imagine that the same amount of water melting from Greenland each year is being lost in California and the rest of the West because of the epic drought there. What happens? The land in the West begins to rise. n fact, some parts of California's mountains have been uplifted as much as 15 millimeters (about 0.6 inches) in the past 18 months because the massive amount of water lost in the drought is no longer weighing down the land, causing it to rise a bit like an uncoiled spring, a new study shows. Sheep dash from their corrals at dawn to feed in a field recently harvested of melons in Firebaugh, California. Photographer Matt Black isn't just covering a story when he's capturing the lives and landscapes of California's historic drought. He's showing us how modern farming and natural forces are irrevocably altering his own childhood home. An inscription on a 3,500-year-old stone block from Egypt may be one of the world's oldest weather reports - and could provide new evidence about the chronology of events in the ancient Middle East. A new translation of a 40-line inscription on the 6-foot-tall calcite block called the Tempest Stela describes rain, darkness and "the sky being in storm without cessation, louder than the cries of the masses." Two scholars at the University of Chicago's Oriental Institute believe the unusual weather patterns described on the slab were the result of a massive volcano explosion at Thera - the present-day island of Santorini in the Mediterranean Sea. Because volcano eruptions can have a widespread impact on weather, the Thera explosion likely would have caused significant disruptions in Egypt. South-central Idaho and the surface of Mars have an interesting geological feature in common: amphitheater-headed canyons. These U-shaped canyons with tall vertical headwalls are found near the Snake River in Idaho as well as on the surface of Mars, according to photographs taken by satellites. Various explanations for how these canyons formed have been offered -- some for Mars, some for Idaho, some for both. A wild weather phenomenon that causes massive winter flooding in California also dumps snow in East Antarctica, wetting one of the driest places on Earth. This is the first time scientists have spotted an atmospheric river snaking from the Indian Ocean south to Antarctica. Atmospheric rivers are long, narrow water vapor plumes stretching hundreds of miles across the sky. California weather forecasters call them the "Pineapple Express," known for transporting tropical moisture from Hawaii to the West Coast during winter. But the weather pattern can appear any time of the year, and atmospheric rivers have been spotted dropping rain and snow in Europe and even in the Arctic. Solar storms -- powerful eruptions of solar material and magnetic fields into interplanetary space -- can cause what is known as "space weather" near Earth, resulting in hazards that range from interference with communications systems and GPS errors to extensive power blackouts and the complete failure of critical satellites. When superstorm Sandy turned and took aim at New York City and Long Island last October, ocean waves hitting each other and the shore rattled the seafloor and much of the United States - shaking detected by seismometers across the country.